Last weekend I drove to the Chicago area to participate in the Missio Alliance Missional Learning Commons in Westmont, IL. The theme this year was on evangelism and brought together pastors, parachurch leaders, theologians, and ministry professors. I’m pretty sure I was the only sociologist in attendance. I was curious to see how the nature of evangelism might be shifting in the context of a post-Christendom culture and whether my ideas about Identity Evangelicalism would resonate at all. While it’s tempting to explore the differing rhetorical and analytical styles between pastors, theologians, and sociologists, I’ll leave that one alone (feel free to write me for my comments!). I’m really most interested in aligning what I heard with what we think we know about coming to faith and sustaining it within an ambivalent culture. Friday night’s session featured James Chambers from InterVarsity. His perspective was closest to what I would consider as classical evangelism: the need to show the Gospel in word, deed, and signs. He was quick to admit that the culture is not receptive to the message but still called for confident action on the part of believers to share their faith wherever possible. Saturday morning opened with David Fitch (theologian at Northern Seminary), who suggested that our post-secular culture has shifted power dynamics. David’s focus was on the importance of Presence, Proclamation, and Power (the order is very important). It is when we are present with others that we can share the claims of the Gospel and then rely on the Spirit’s power to make change. Rick Richardson, professor of evangelism at Wheaton, did a great job of summarizing the sociological literature on millennials and faith (while dampening some of the extremist language). He said that we often over-react to previous models of ministry and we need to be careful not to jump ship “just because”. Still, he affirmed that belonging seems to be preceding believing so that it’s important to hear other people’s story in the midst of actual engagement. Rather than seeing evangelism as being about individual we look to build connections with “people of peace” and allow the Spirit to work through them. Jason Smith is a Vineyard pastor from Ohio and told of the ways in which he has found opportunity to engage others in the everyday work of the life of the church. His premise is that asking to pray for others while expecting the movement of the spirit is what brings about life change. Tim Catchim of the V3 Movement spoke last. He constructed a two dimensional model: the horizontal axis contrasted process change (Road to Emmaus) with crisis change (Road to Damascus) while the vertical access moved up from Presence to Proclamation. He suggested that our traditional model of evangelism could be found most often in the upper right corner (Crisis Proclamation) but that many other options exist that often get ignored. As I listened to the presentations, I found myself thinking a lot about John Lofland and Rodney Stark’s model of conversion. 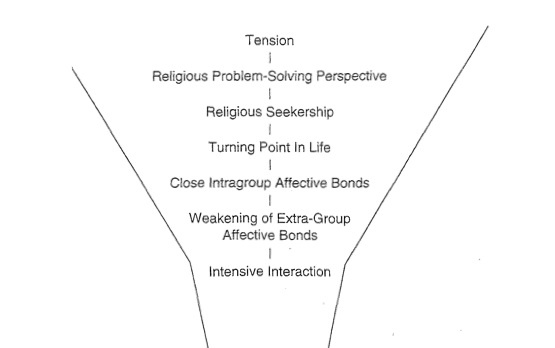 This work, based on studies of the Unification Church before it was famous, provides a model of how people convert to deviant religious groups. But it also applies to non-deviant groups. In fact, James’ presentation Friday night had a slide remarkably similar to the Lofland/Stark model (I took a bad picture or I’d share). The model begins with persons feeling a sense of tension in daily life. Lots of people sense tension but don’t move further than counseling. But those with a religious problem solving perspective turn toward spirituality in search of solutions for the tensions. If they feel comfortable beyond just dabbling, they adopt a form of seekership, which makes them open to new ideas or worldviews. Following a sense of crisis, they turn more seriously toward the religious group. The religious group embraces the new initiate with what Lofland called “love bombing” — massive interaction at a retreat far away. Over time, the new group becomes the “in-group” while family and friends represent a past way of life. Once the member is inside, the intensive interaction continues, keeping the new group member committed. The Lofland/Stark model faces some challenges in contemporary society. First, people aren’t really sensing existential tension. Given the general nature of Moralistic Therapeutic Deism in society, a generalized belief in being “a good person” dilutes a sense of potential crisis. Second, in post-Christendom society, people may be much less likely to be looking to religious worldviews for solutions. The old “if you were to die tonight, do you know you’d go to Heaven?” question works if people believe that there is a heaven and that there is a serious risk that they wouldn’t be going there. The nature of apologetics becomes problematic because it may be providing answers to questions that people don’t have. And yet, it still makes sense to look at the model. I’d suggest that we start with Lofland’s third step. We have people in the midst of challenge. And in the midst of that challenge, other people come alongside that represent support that is not dependent upon first solving the challenge. This is what David Fitch means by “presence”. It’s why Rick Richardson goes to Burning Man (one of the stereotype-exploding facts of the weekend!). It’s why Jason Smith lets the homeless guy down the block mow his grass. Out of the engagement within challenge, the person senses that someone actually cares. That belonging is real. Such a modified model of evangelism leads us back to the presence and process model described by Tim Catchim. As he says, it’s not that there aren’t people impacted by other strategies. But evangelism in a post-Christendom, post-modern, complex culture may take on a very different form. We’d still want converts to maintain past connections as long as they are still involved in the discipling process that comes with ongoing meaningful interactions. Belonging lies at the heart of the post-modern search and will open the door through which the Holy Spirit will do his work. I love the idea of belonging as real, because so many times belonging is a temporary thing at best. It’s what I try to foster in my classroom – a sense that if you’re there, you belong. It’s not always easy. Interesting. Love seeing the work of sociologists here. I think if more Christians took the time to engage with guys like Stark it would really help Christians understand how people outside the church actually think. Good stuff. Thanks.